I look out for books about hostels. I call it research but I’m a book maniac anyway, always reading a book or two. Stuck for something to do, waiting for a meeting, a train or an appointment, I head for the nearest bookshop. I look for books that tell me more about youth hostels. 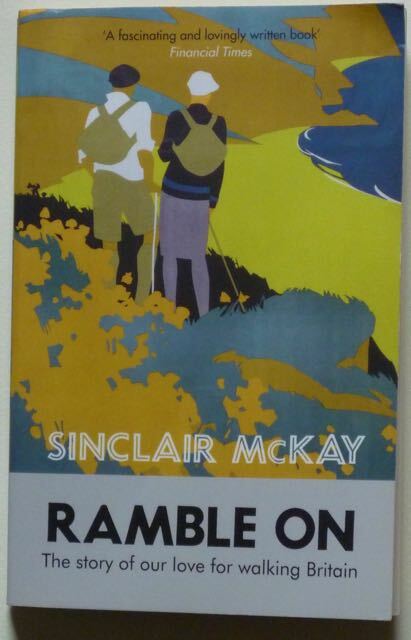 That’s how I found Ramble On: The Story of Our Love for Walking Britain, by Sinclair McKay. He writes for the Telegraph and Mail on Sunday. McKay writes well about walking. He sounds like a keen and enthusiastic walker, not a bore but someone it would be fun to go walking with. He’s adventurous. He’s walked in cities, on the Kent marshes and on Rannoch Moor, not just the Lake District and Peak District and all those places we expect walkers to go. And he’s stayed in youth hostels, when he was younger. Plenty of others have written about walking, from GM Trevelyan to Robert Macfarlane but McKay’s book is full of surprises. I didn’t know that young mill hands were walking for leisure in the 1840s, or that walkers used Great Western Railways to get to Dartmoor and back in a day, just like they used Southern Rail and the lines from Manchester and Sheffield. McKay intriguingly suggests that trespass never became a criminal offence to protect fox hunters, crossing fields and gardens in pursuit of the inedible, from prosecution. Neither did I know that Ewan McColl took part in the Kinder trespass which inspired his writing of the Manchester Rambler. McKay keeps coming up with new facts about and interesting places for walking. As well as the Lake District, Peak District and other classic walking areas, he goes to the Forest of Dean, walks in cities, writes about night walking and covers the Thames marshes and Rannoch Moor. It all makes his book fresh and interesting. This is a book to savour and enjoy, inspiring for the different ideas given, of places to walk and landscapes to visit. It deserves to be better known. What books have you read about the outdoors. Did any of them surprise you? Are there books you think should be on my shelves as classics in the story of the outdoors, youth hostels or walking.